Working with kids, moms, and families is one of my favorite things. So much so that I quit a higher-yielding, higher status RD position and took a 38% pay cut to become a Public Health Nutritionist with a local WIC & Nutrition Program, working precisely with the women, infants, and children I’m so passionate about. Why am I so passionate about this population group? Because what better way to truly make a difference in someone’s life and their nutrition and health than during mom’s pregnancy and the early years of a child’s life?! Part of what gets me jazzed is helping moms and families discover healthier, easy alternatives to those tried and true family favorites. Which is where these Almond Chicken Nuggets come into play! You think of chicken nuggets and you think of kid food, right? They’re delicious, you can use your fingers to eat them…heck, when you’re five, what’s not to love? Well….the fact that most nuggets use random conglomerations of chicken parts (i.e. white meat, dark meat, skin, fat, etc. ), refined white flours for battering, and deep frying in oil. 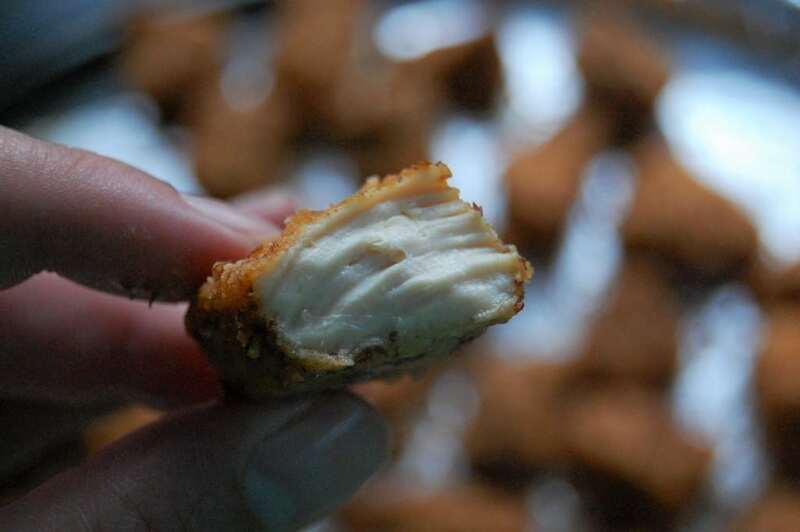 These nuggets utilize boneless, skinless chicken breasts that you cut into bite-size pieces. The “breading” is a naturally gluten-free alternative that also boasts fiber, protein, and healthy fats – almond meal (aka ground almonds). Season with a few basic spices, bake briefly, and boom….an irresistible dinner alternative that kiddos and adults won’t be able to stay away from. Line a baking sheet with a piece of aluminum foil (helps prevent sticking and makes for easy cleanup). Spray foil with nonstick spray. 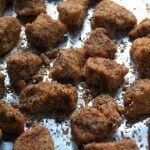 Trim chicken and cut into small, bite-size pieces. Combine almond meal with salt, pepper, garlic powder, and smoked paprika. 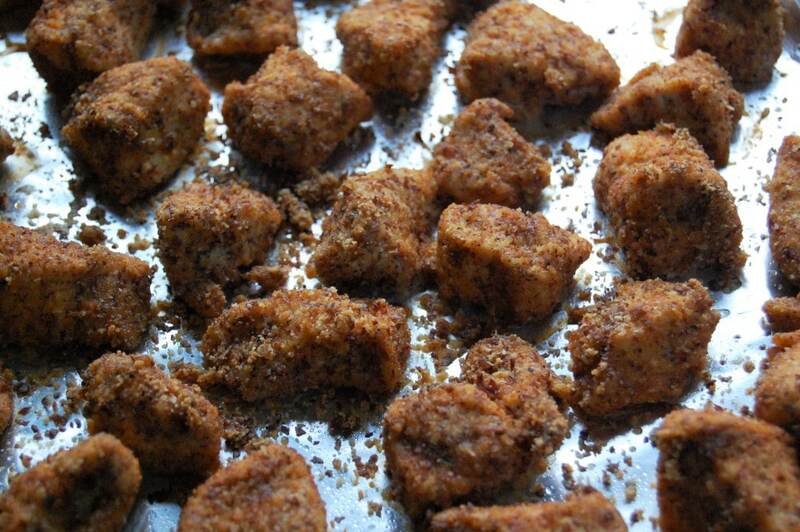 Toss chicken pieces with seasoned almond meal. Place chicken pieces onto cookie sheet, making sure they're not touching. Cook for 10-12 minutes. If your pieces are cut larger, you may need a few more minutes - just make sure to cook until the internal temperature of the chicken is 165 degrees.